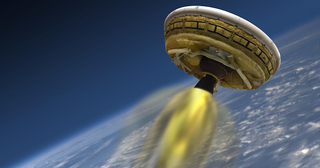 Watch NASA Test Its Rocket-Powered "Flying Saucer" Live On io9! After scrapping all of its planned test launches earlier this month, NASA will today attempt to release its Low Density Supersonic Decelerator (LDSD) from the edge of space. The rocket-powered, flying saucer–shaped landing vehicle will then return to Earth on a dramatic path through Hawaii's skies. Watch it live, here! Principle investigator Ian Clark said earlier this month that he and his team were "very optimistic," and "hoping to test the vehicle at the end of the month" – so fingers crossed, everyone!